There is a SEPA Comment period open for the proposed Hilby Station Apartments that we heard about last month. This is a 32-unit apartment complex on Palouse Hwy. just south of the intersection of Freya and Palouse Hwy. The comment period is open till Friday, October 6th and you can submit your comments to the County Planing Department by emailing Dawn Dompier at ddompier@spokanecounty.org. We have written before about the CUP for the proposed memory care facility at 44th and Freya. The City is now seeking agency comments on the CUP and they are due by close of business Thursday, October 5th. Submit your comments to Stephanie Bishop at sbishop@spokanecity.org. Have fun considering these two projects. I encourage all of you to submit comments, however brief to let the City and County know what you think of the ongoing development up here in Southgate. 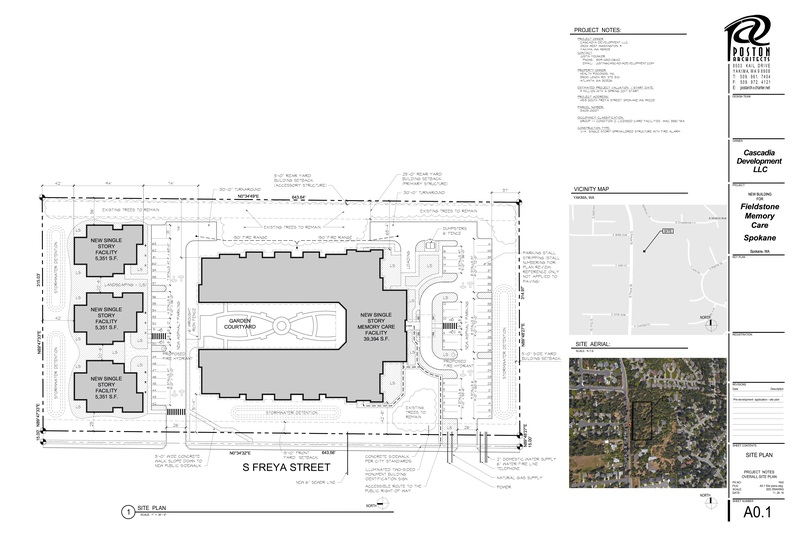 Southgate has received a notice that another group is proposing to develop an assisted living facility at 44th Avenue and Freya and the developer will be holding a Community Meeting on Tuesday, April 11th at 5:30pm at the Southside Community Center. This new project is being called Fieldstone Memory Care and the site plan shared with the City at a pre-development meeting in December shows a 39,000 sq.ft. single story building with three smaller 5300 sq.ft. bungalows being built along the 44th Avenue trail on the north side of the property. Pre-development notes from the City show the development will include 60 beds (a decrease from previous proposals). They City also indicates that they want the developers do construct full right-of-way improvements including curb, sidewalk, and pedestrian buffers along Freya. They are also encouraging the project to connect to the 44th Avenue Trail as an amenity for their residents. This site is currently zoned as single-family residential, but it did have a Conditional Use Permit (CUP) granted in 2008 allowing development of assisted care facilities. That original CUP expired, so these developers would have to re-apply for a new Conditional Use Permit. As with previous proposals for this site, there will have to be extensive geotechnical and grading work done to make the site useable as indicated in the site plan.